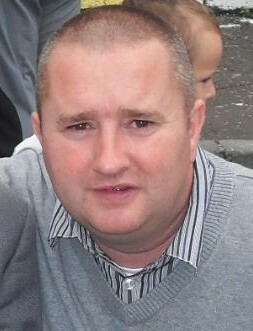 Over the summer holiday period of 2009, a general clean up of the St James area of west Belfast was planned – a partnership between the local Residents Association and Youth Outreach Workers assigned to the district. Several places of concern were targeted for action, usually areas used as gathering spots for teenagers, many of whom were consuming alcohol and other substances. In the past, these areas were the focus of conflict between the young people, many of them vulnerable, and the local community in general. One such hot spot was at the major junction in the district, that of St Katherine’s and St James’s road, the fulcrum of the whole area. As youth outreach workers, we approached the owner of the house beside which the youths would congregate, which had a large exterior wall running along its length, covered in unsightly graffiti. The householder was very accommodating and readily agreed to allow us to target the wall and its surrounding area for improvement. I then approached a crowd of teenagers who were gathered at the wall for help in removing graffiti and replacing it with a mural depicting something positive about the local area. They all agreed to get involved. The idea was put forward that this mural should remember Belfast Celtic and Celtic Park – a local landmark. Within one day of the idea being floated, local artist Martin Dillon had agreed to supervise the painting activities and the Belfast Celtic Society provided all the necessary funds for paints and brushes. Literally, within 24 hours we were on our way. Over the course of the next six weeks, the mural took shape through hard work from the artists and local volunteers - particularly Joe Rooney, who helped the supervision of the young people and Caoimhe O'Prey, a talented young local artist who set to work outlining the various portraits of the famous Celts. We also used the mural as an opportunity for education and personal development for the young people, who learned that the Ronaldo’s, Gerrard’s, Larsson’s and McGeady’s of the time played on their doorsteps. To attend the mural unveiling and hear the compliments of literally hundreds of residents, young people and ex-Belfast Celtic players was a source of great pride – something that has once again been injected into this community. Since the unveiling, the amount of visitors and tourists who have come along to view and photograph the mural has been amazing. It is a huge credit to all those involved and it would be nice to have the mural included in the official mural tours, because it is a huge part of local history as well as being of interest to the millions of Celts throughout the world who have heard or read stories about Irelands most extraordinary team. Thanks to the Belfast Celtic Society for their support and encouragement. You can see a film of the making of the mural and the unveiling here.